One of California’s unspoiled treasures is the Tejon Ranch, north of Los Angeles and south of Bakersfield, up in the Los Padres Forest. 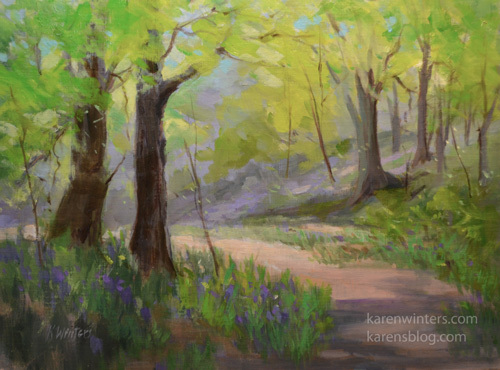 I had the pleasure to do some plein air painting there, and this is one of the pieces that came from the trip. Free range cattle roam through the hillsides, and you’re as likely to meet a steer as a rattlesnake or a cottontail rabbit. It’s Old California in the very best way. I’d love to get back there again sometime to paint. Lovely trees, and where is that road going? Got to follow it. Delightful, Karen.